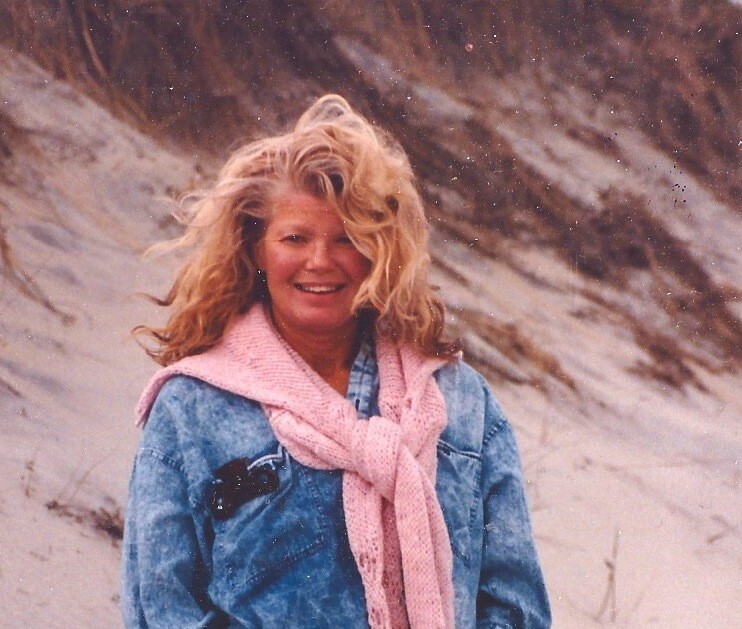 Allowing answers to be revealed……. it seems to me that we spend our lives trying to solve problems by looking at what seem like the obvious solution. For example, when painting a portrait it is quite common to see an artist struggling with one area of the face, let’s say the nose. Back and forth we go adding and deleting paint, when often all that’s needed is a shadow next to the nose….and voila – the answer is revealed. In this instance, to reveal the calla lily, I have gone into the area surrounding it, or what we call the negative space……. All the white in this image is dry white paper. 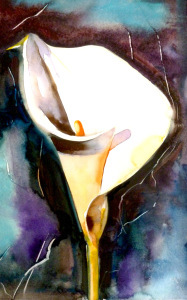 This entry was posted in Uncategorized and tagged allowing the answer to be revealed, calla lily watercolour, negative space on September 3, 2015 by janetweightreed10. When the answer is revealed…. This exercise is all about observing the whole picture, – the subject and the area surrounding it, which is referred to as the negative space. 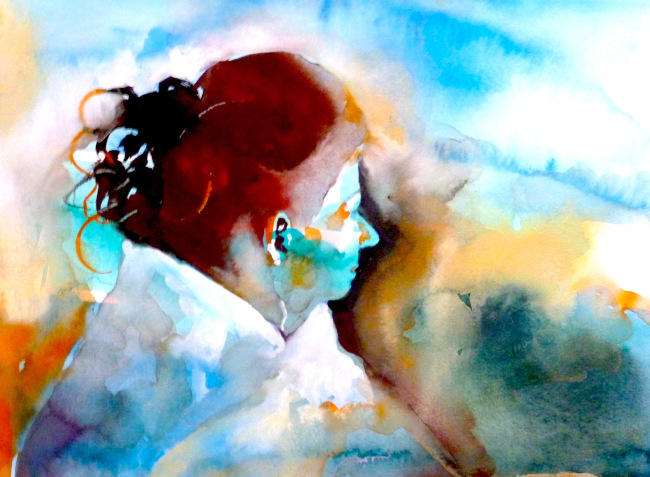 I sometimes see people struggling with one area of a painting that they keep going back to time and time again….adding and removing paint, when quite often all that is needed is a shadow or some colour thrown into the negative space. It’s much like life when we are trying to solve an ongoing problem. We tend to keep going back with the same solution, which doesn’t work! It’s not until we look in another direction, in this case into the negative space surrounding the Cala Lily, that the answer is revealed. As we approach paintings and life from a different point of view….new solutions and answers are revealed. For this image I used a mix of colours that happened to be on my palette….and then scraped out some colour with a knife, which gives energy and breaks up the background space. Note that all the white you see is dry white paper. I used the same dark tone/value in the back ground colour as I did for the dark shadows on the lily, and just a touch of Winsor & Newton Green Gold and cadmium orange to pull the image together. 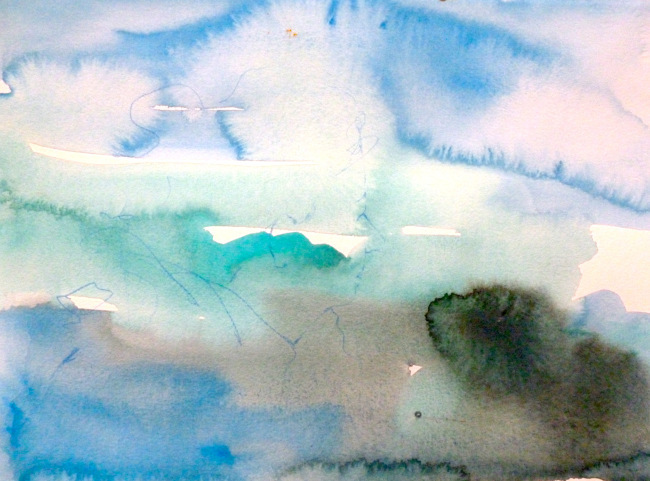 I never use black when watercolour painting….it deadens the picture. Instead, I mix Burnt Sienna and Prussian Blue….or other combinations of browns and blues….which produce a beautiful rich dark. A Colourful Magical Hummingbirds for the day. This entry was posted in Uncategorized and tagged a different point of view, allowing the answer to be revealed, calla lily, janet weight reed, janet weight reed colourist, leaving dry white paper, magical hummingbird, negative space, observational skills, seeing differently, the apple exercise, weight reed artist on June 10, 2014 by janetweightreed10. I needed to play and doodle yesterday, and so I pulled out a piece of watercolour paper which I had already thrown some paint on. Not sure what I originally intended, but that’s not important. If you look closely you can see that I have sketched the profile of Claudia, with a blue water colour pencil. I used a photograph of Claudia as my jumping off point. Anyone who has taken one of my workshops will know how important I consider the warming up process to be. Like dancers, musicians and athletes, painters need to warm up at the beginning of the day. Playful exercises using newspaper, wall paper lining or painting over old sketches is freeing. In this frame, it’s all about the negative space….applying colour into the area surrounding the profile, which immediately reveals the face. Even though I am working over a colour ground, I have applied juicy watercolour next to the face, and then with a clean, wet brush, I have pulled the paint out. Remember when working from a photograph, it’s not about copying – rather using it as a jumping off point. Given that I am working off a colour ground, I have applied some Winsor & Newton gouache, permanent white…Had I been working on white paper….I would have left dry white paper for my highlights. I have added some Cadmium Orange water colour which brings a vibrancy to the image. In the final frame I decided to use the Permanent White, along with some Naples Yellow gouache around the image to bring a sense of interesting light and movement. An artist who was recently visiting, talked about the problem of feeling that everything she did had to be a finished painting, even in her sketch book. In our discussion she realised how this attitude prevented her from playing, doodling and freeing up. 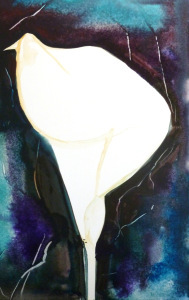 This entry was posted in Uncategorized and tagged Claudia Notalle French actress, janet weight reed, light and movement, negative space, photographs as a jumping off point, weight reed artist, wet brush no paint, Winsor & Newton gouache, winsor & Newton watercolours on May 27, 2014 by janetweightreed10. As I mentioned earlier, the purpose of this course was to work on watercolour technique and at the same time observational skills. The watercolours shown in this post are a small sampling and they are in no particular order. I would begin each session with demonstrations….in this case using flowers from the Market, I made rapid watercolour sketches on white paper and paper with a colour ground. The course is for all levels, including total beginners, which brings me to the first image which was painted by someone who had never been to a watercolour class before. 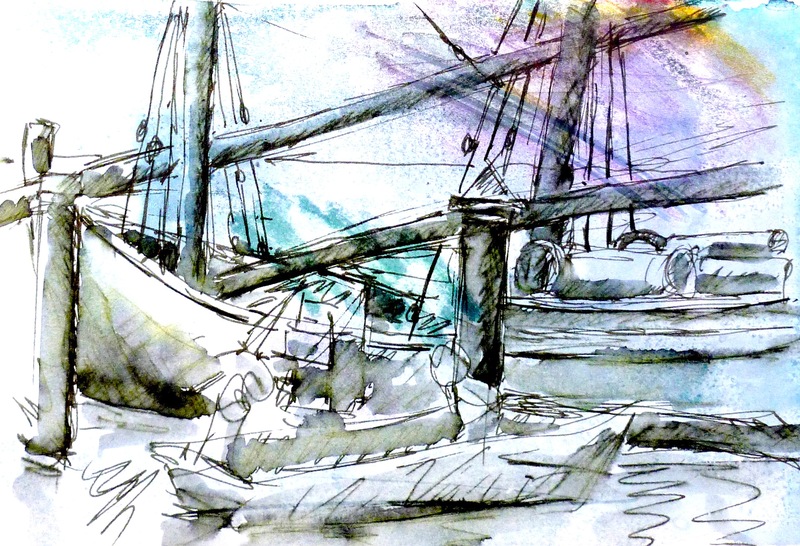 One of the key elements of the course is to show people how to avoid the age old problem of muddiness in their watercolours. 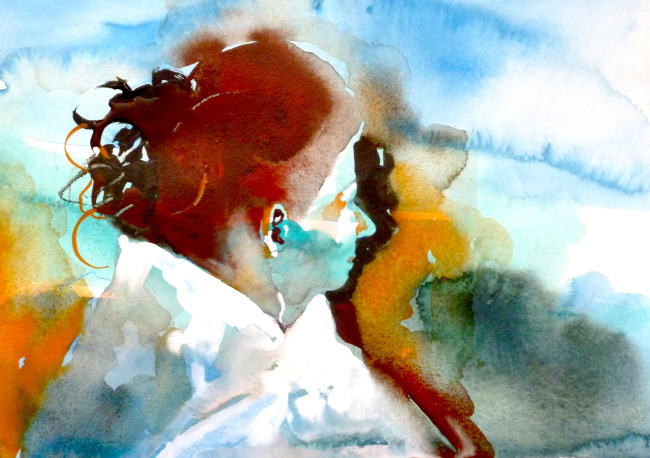 One of our group who had worked in watercolour for quite some time had become very frustrated with this issue, and so I was delighted to see the work she produced…..with absolutely no mud! Although the emphasis of my workshops is to use watercolour in a spontaneous manner, sometimes it’s very helpful to make more detailed observational studies. This watercolour of beans from the market, is just that – an observational exercise. Much emphasis throughout the week was all about the use of sketch books. Here you can see the sketch made when visiting the Island of Culatra, and the beginnings of a watercolour painting from the sketch. 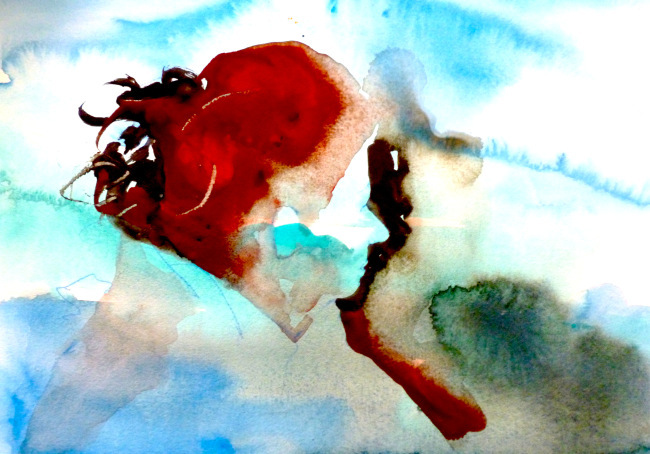 A series of lily watercolours – exploring the use of negative space in an image. Taken from a small sketch. One of the group had a particular interest in trees and made many interesting studies. Sketch on a colour ground in sketch book. Using strong colour in the negative space to achieve a sense of drama. There was so much more work, but these images will give an idea of what was achieved. 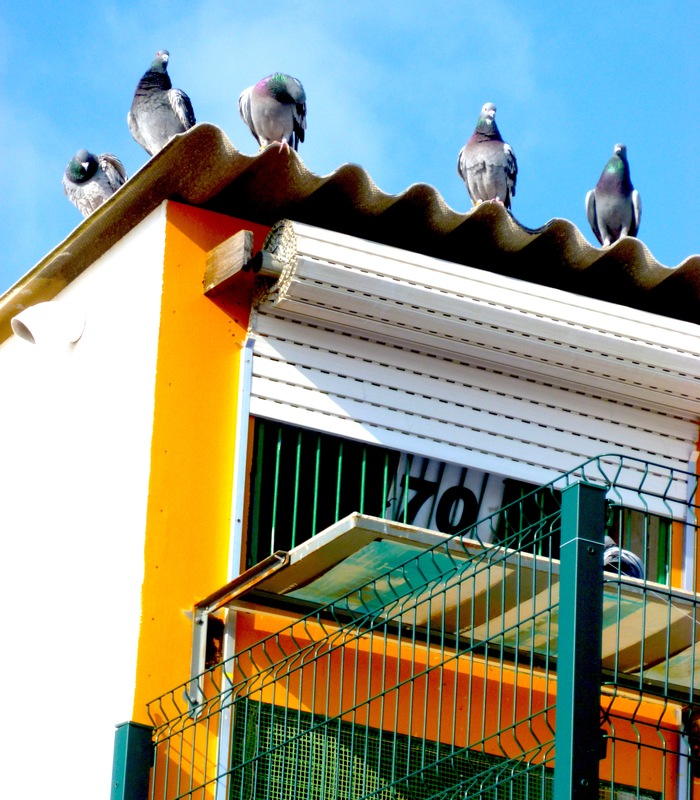 One of the lasting memories I will have is painting in the courtyard later in the day when local pigeons would be let out. The flapping of they wings would cause a beautiful dream like echo…..quite lovely. 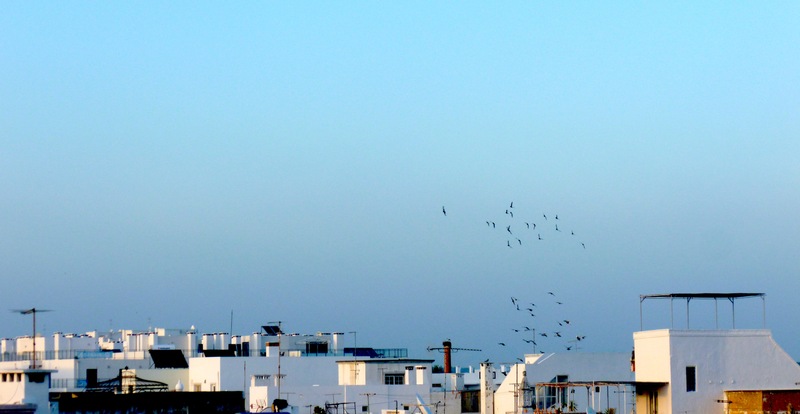 The pigeons seen from the roof of the school….flying free. I will now look forward to my course at the school next April…. 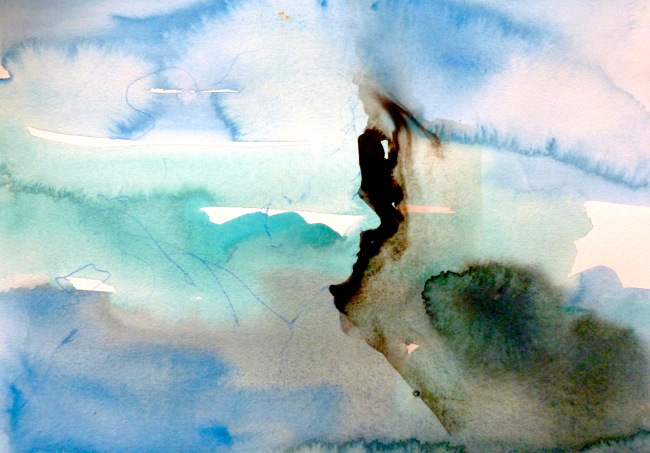 This entry was posted in Uncategorized and tagged art in the algarve, avoiding muddiness in watercolour, calla lilies, culatra portugal, david clark olhao, detailed watercolour studies, janet weight reed, negative space, observational skills, painting trees, pigeon fancier, spontaneous watercolour painting, watercolour demonstrations, watercolour techniques, weight reed artist on May 2, 2014 by janetweightreed10. My second demonstration once again tapped into the importance of negative space, and observation. The difference here is that the painting of the petals was less spontaneous and more considered. Using a photograph of magnolia petals as my jumping off point, I made a loose sketch of the petals, and then immediately wet the area in the negative space surrounding the petals, and applied juicy paint with a loaded larger brush. I then allow the paint to bleed out to the edges of the paper. This is an exercise in letting go of control…. For the petals I leave dry, white paper. In a much more controlled manner, I then apply tiny amounts of pigment to each petal, being careful not to allow areas to bleed into one another. The total opposite from what was going on in the background. Given that I was painting this as a demo, there were time constraints, however, I might work on this painting over the next few days, developing more of the petal area. Note the importance of leaving dry white paper for the highlights…and also note how the white paper shines through the transparent pigment. The most important technique used in the petal area, is the use of a wet brush with no paint to pull out the small amounts of pigment applied to each petal. This is also why it’s very important to have a minimum of four pots of water at all times….so that there is always clean water available. I enjoy the mix of loose, spontaneous painting with a more considerers detailed area. Again it’s important to remember that everything is interconnected, and so by bringing some of the same colour used in the background into the foreground we achieve a sense of natural harmony. Because I was demonstrating and emphasising the importance of playing and experimenting, I then dropped some of the Winsor & Newton, Desiginer Gouache, Permanent White into the background….suggesting more petals, without any detail. Note the two different areas of white….one using designer gouache, permanent white, and the other area on the petals, where the white is all dry white paper. There are still a few places available for my workshop in April on the beautiful Algarve, Portugal. 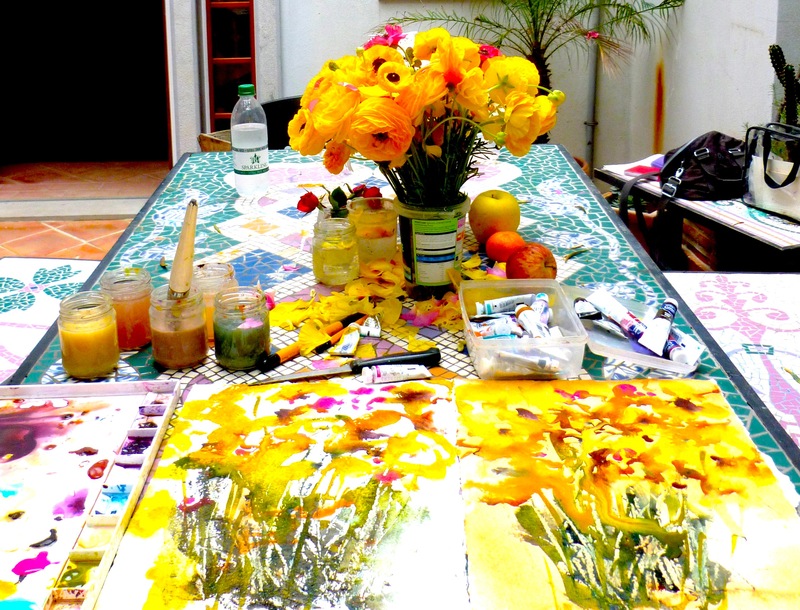 Situated in an historic area of the Algarve, the venue affords excellent opportunities for outside and indoor painting. With charming inner courtyards and a superb studio area, it is well equipped. This entry was posted in Uncategorized and tagged algarve portugal painting, art in the algarve, janet weight reed artist, Janet weight reed workshops, letting go, magnolia tree, negative space, observational skills, watercolour demonstrations, winsor & newton artist paints on January 28, 2014 by janetweightreed10.